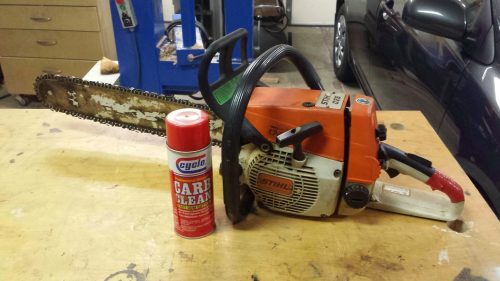 If you have an older chainsaw, you’ve probably heard it say this before: “Help, Help! cough, umpfh, vrooooommmmm! 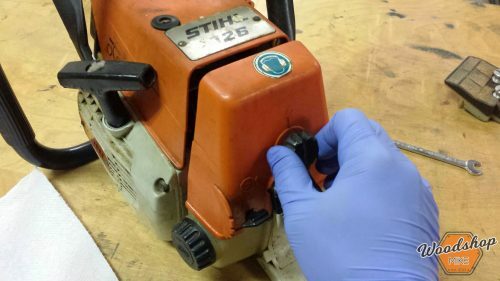 cough, sputter, death.” I’ll walk you through the steps of rebuilding a carburetor andl bringing a Stihl 026 chainsaw back to life. Maybe I shouldn’t lead off with this, but my Husquvarna 55 has never given me trouble… Just sayin’. The 026 was given to me. Yes, pretty cool, right? It was in a box… In pieces… With enough oil impregnated swarf packed into each nook and cranny to make a dozen toxic candles. The first step was clear. CLEAN!!! Tooth picks, nylon brushes, and a steady supply of compressed air were the tools needed for this project. After replacing the spark plug and putting some fresh gas in the tank, she was purring like a kitten. Fast forward about a year and things aren’t so dandy. Once the saw would turn over, it would immediately die. Nothing is more frustrating. So what’s the problem? 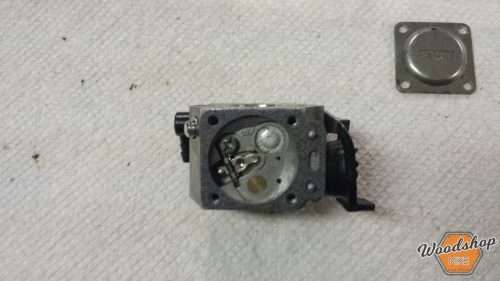 Well, I had a hunch that the carburetor needed to be rebuilt, so I tore it apart and what do ya know. The diaphragm was torn… This is obviously an issue. Lets hope it runs like a top when I get it back together. 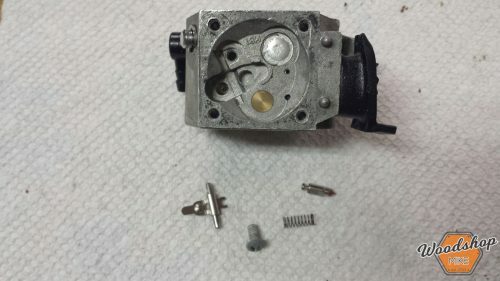 I found my carburetor rebuild kit online for less than $10. 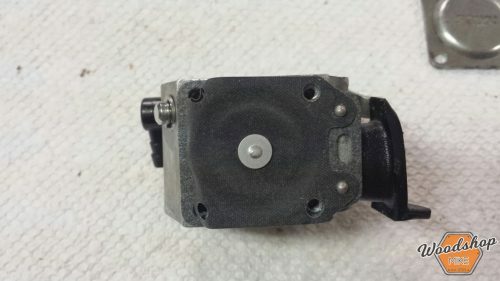 If you try getting these parts from your local chainsaw shop… Well lets just say you shouldn’t even bother calling because it will be at least 3 times more expensive. 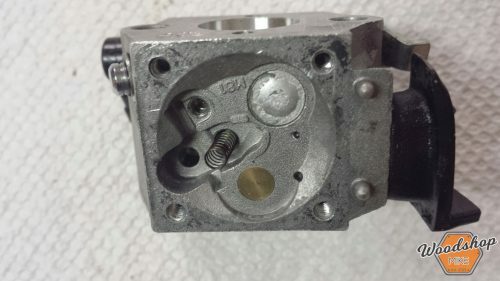 Rebuilding a carb is pretty straight forward. Keep track of the way things come apart. 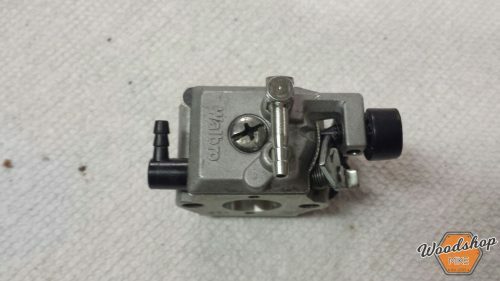 Catch the spring that wants to go airborne from the needle valve. Give everything a good soak of carb cleaner and then reassemble. Easy, right? Well, just in case you like pictures as much as I do, you’re in for a treat. Now flip the master control lever, a.k.a. choke lever to full choke (all the way down). 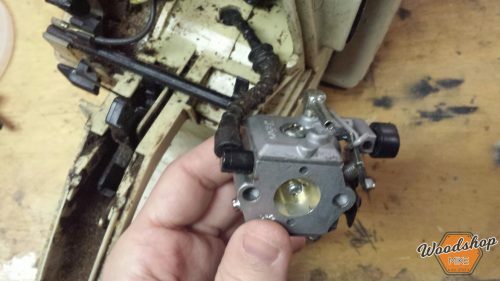 You should now be able to pull the carburetor out. Mine was in there somethin’ fierce, so you just gotta tug a bit. 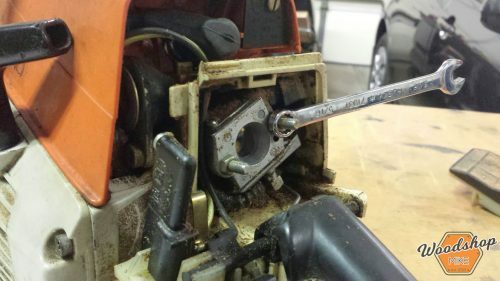 I would not recommend using a screwdriver to pry out the carb. 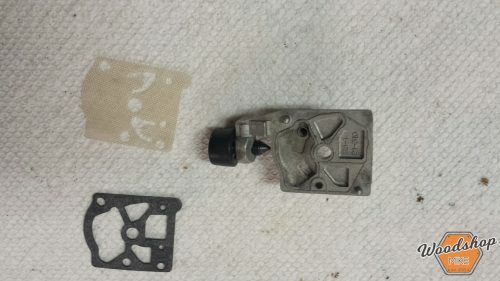 There are two barbs that come off of the carburetor. One goes to the gas line (which will be attached) the other goes to the impulse line (which will have to be pulled out. I also highlighted it for you). At this point the throttle control wire will also be connected to the butterfly control arm. 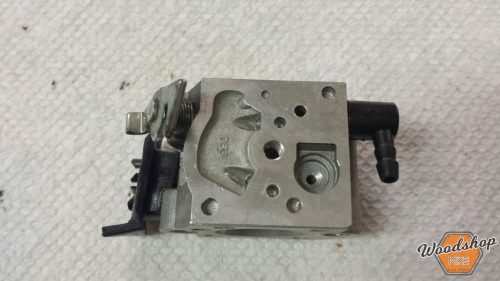 Just pull the gas tube off and then you will be able to manipulate the throttle wire in such a manner that it too will disconnect. 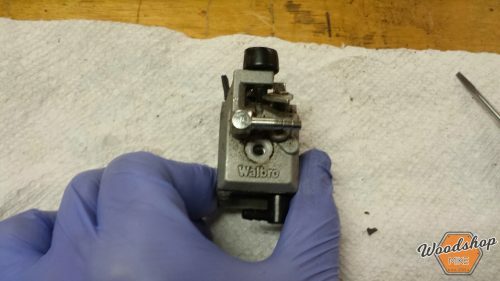 This process will be easier if you go ahead and give the carburetor a cursory cleaning before you start disassembly. Just wiping it down with paper towels and blowing off the loose dust should be good enough. I start by removing the plate that covers the diaphram and pretty quickly see that it is well used. I remove the gaskets and lay them out in the order they were disassembled. 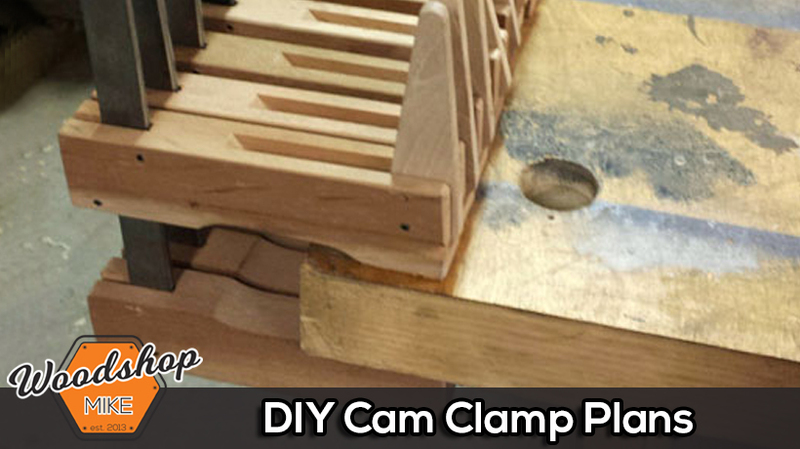 Flip ‘er over and remove the other cover by loosening a single philips head screw. 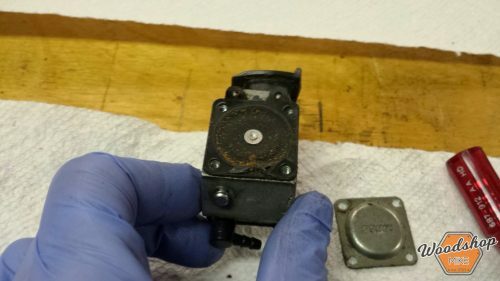 You will uncover a gasket and screen on this side. Again, lay them out in the order that they were disassembled. 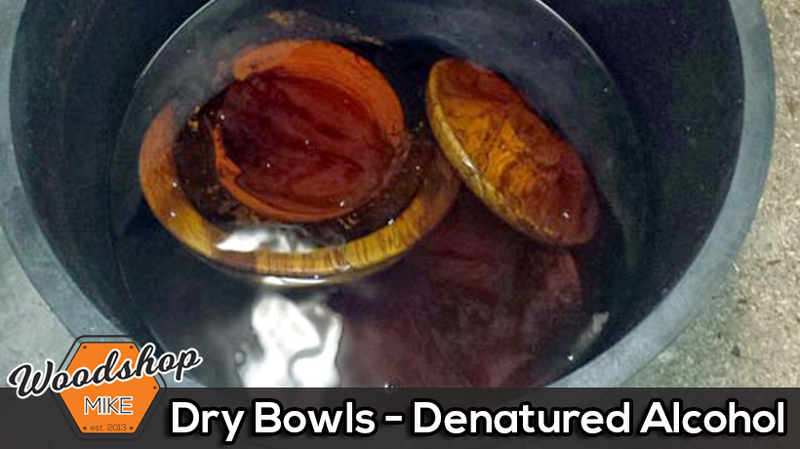 There are still a few items to get to before we start replacing gaskets. The needle valve and fuel screen need to be cleaned or replaced. A word of caution. You remember that spring I mentioned earlier? You’re about to find it so don’t go all A.D.D. and pay attention. 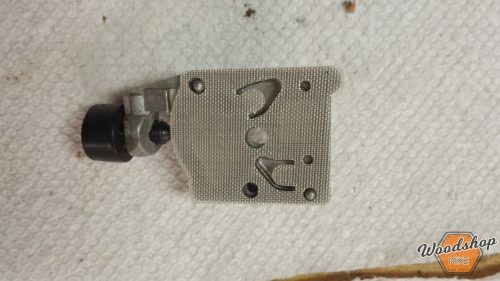 There is a rocker that is held in place with a philips head screw. 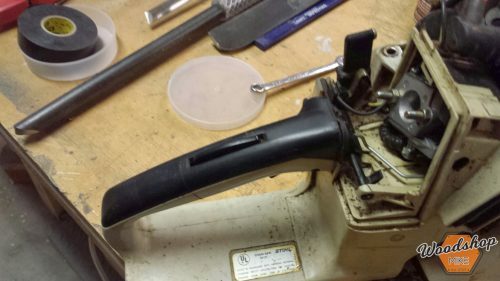 Place your thumb over the side of the rocker that is closest to the center of the carb. 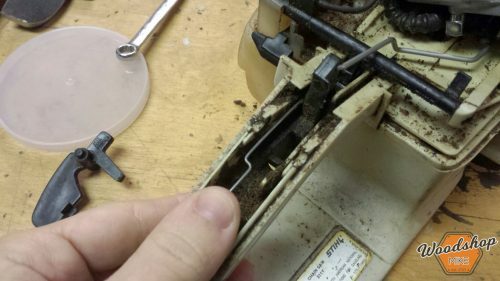 Once you’ve removed the screw, that spring wants to hide under the pile of dust in your shop where you will never find it again. 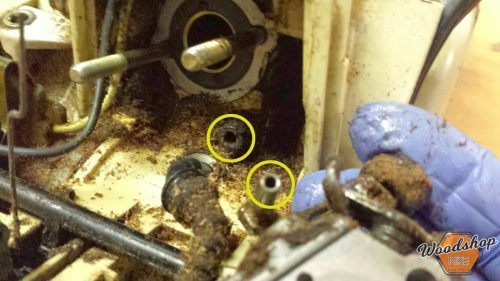 Slowly lift your thumb and collect the rocker arm, spring, screw, and needle. A magnetic tray is a great place for these to live until you’re ready for them. Now flip ‘er over and take a look at the little mesh screen. 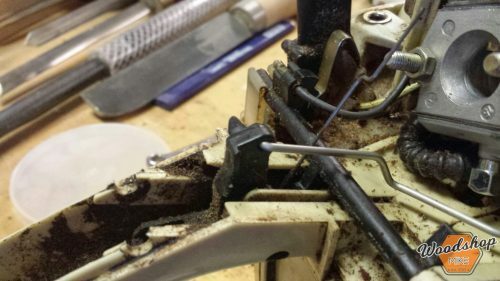 Before you yank this thing out, make sure that you have a new one in your rebuild kit. If not, either don’t remove it or be extra careful. A small metal pick works well to remove this screen. If you don’t have one, a small flat head screw driver works well also. 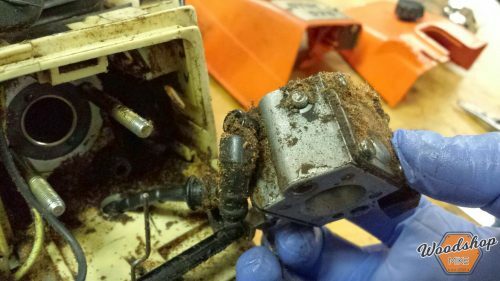 Carb Cleaner To The Rescue! 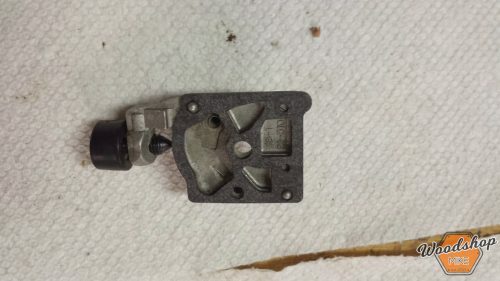 With all of the gaskets and such removed, you’re ready for the carb cleaner. Soak this thing down and let the cleaner drain through all the passages and you should be good. 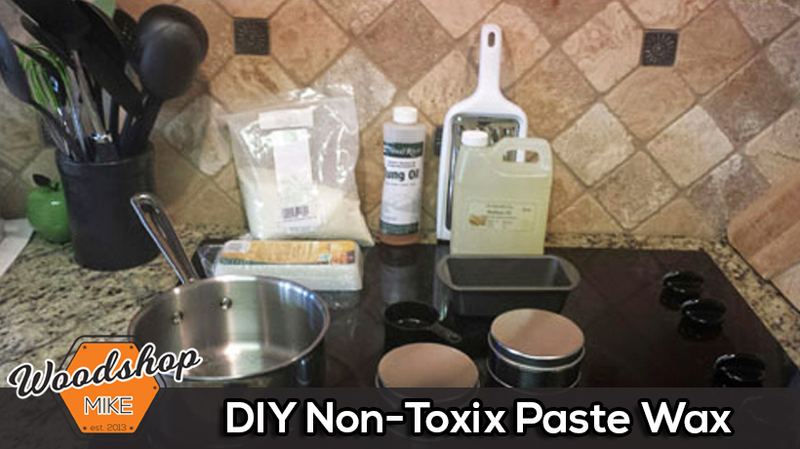 Make sure to spray every nook and cranny. I did this step one morning before heading off to work. That evening I got into replacing the components. 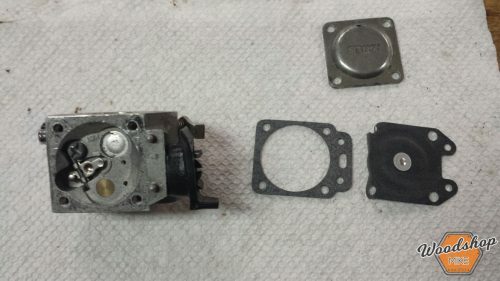 I’d let the carb sit at least 30 minutes to allow everything to dry off before reassembling. 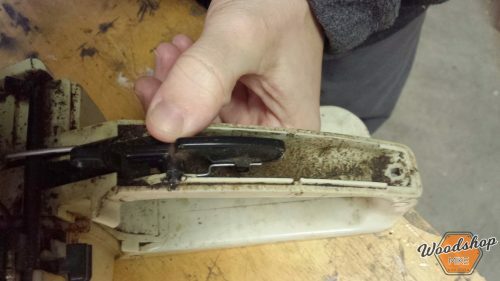 Start with putting the screen back in (if you took it out). A pencil eraser works quite well to push the screen into place. The screen will (at least mine was) be creased a bit. Put the screen in place similarly to a coffee filter. Those of you that are Keurig only folks are just screwed unless you remember what a coffee filter is… I’m a french press kinda guy myself, but that’s just a bit off topic. 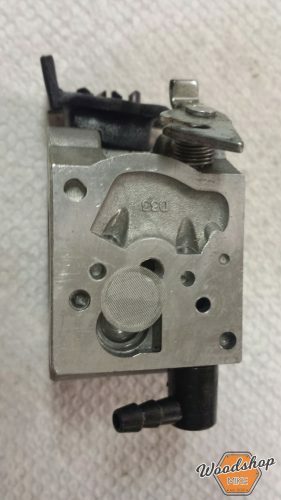 Ready to put the needle valve back together? I hope so. Start off by placing the small coil spring in it’s home. 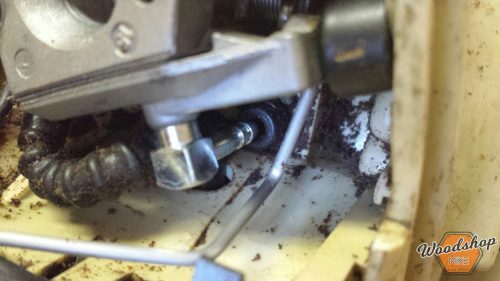 Put the needle in the rocker arm as shown. 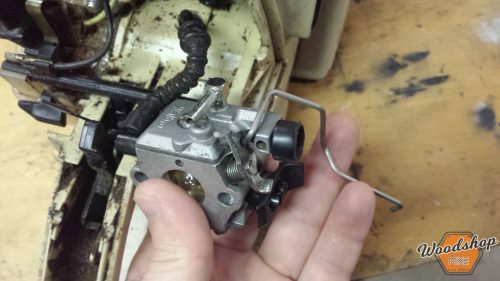 Place the rocker arm and needle back on the carburetor. If you can’t remember the correct orientation, the dimple in the rocker arm goes over the coil spring. Keep your thumb, finger, and friend’s thumb on the assembly while you walk across the shop to get the screwdriver you’ll need to run the philips head screw back in place. I promise that’s the hardest part of this whole post. Moving on to gaskets. Basically you just line up the holes and lay them down in the opposite order that you removed them. Follow along with the pictures if you don’t remember. Also, I did actually put all four screws back, just not for this picture… Not sure why. Now for the other side. It’s the same song and dance. 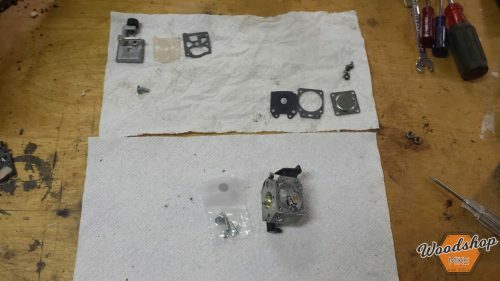 Replace the gaskets parts in the reverse order of disassembly, and if you don’t remember… Well, that’s what the pictures are for. 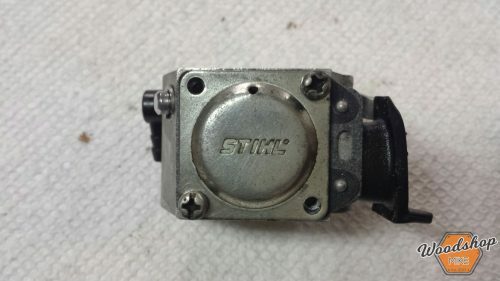 Carb Back In The Saw! Alright! The carb is back together. 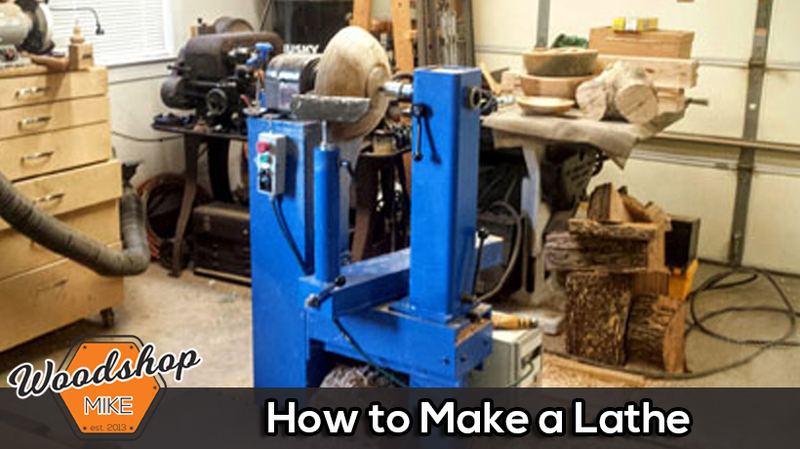 Now just slam that bad boy on the saw and let ‘er rip! First on the list is to reconnect the gas line. The gas line is the longer of the two tubes. It hooks up the the black barb. Now is also the time to reattach the throttle wire. Any words I used to describe it’s orientation would be futile, so hopefully the picture will get you there. 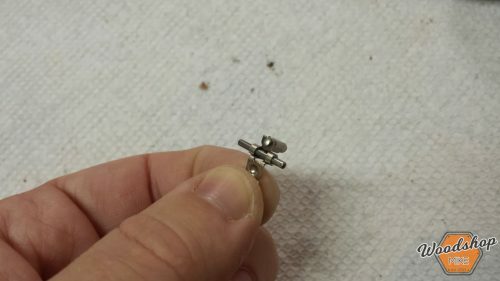 Once these are attached, you’re ready to place the carb on the threaded studs. The chrome barb will line up with and self insert into the impulse line. Run the nuts up snug and that part’s done. 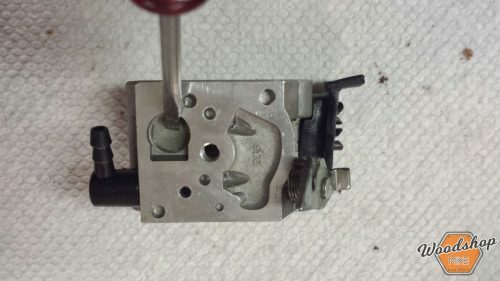 The last step before slapping the covers back on is to reattach the throttle wire to the trigger. The throttle mechanism is a two part system which requires you to be gripping the handle to rev the motor. There is a spring that wants to poke your eye out. Push it down into the handle and place the remaining throttle component on top of the spring. 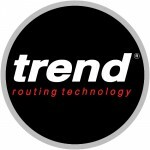 There will be a little indention that will hold this spring in place. Once that’s done, reinstall the handle cover and you’re done. 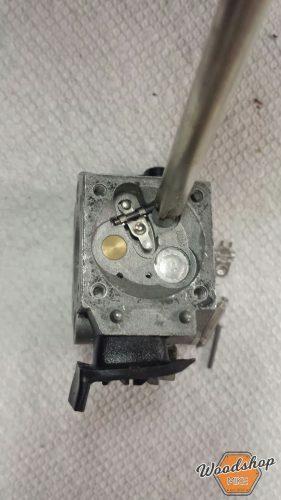 As long as you didn’t turn any of the adjustment screws on the carburetor in the process, you should be good to go. Unfortunately my troubles did not end with the carburetor rebuild. 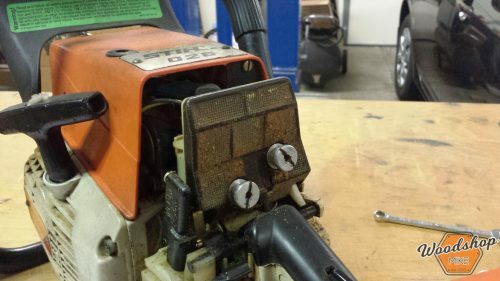 The saw was dreadfully low on compression and would not run. 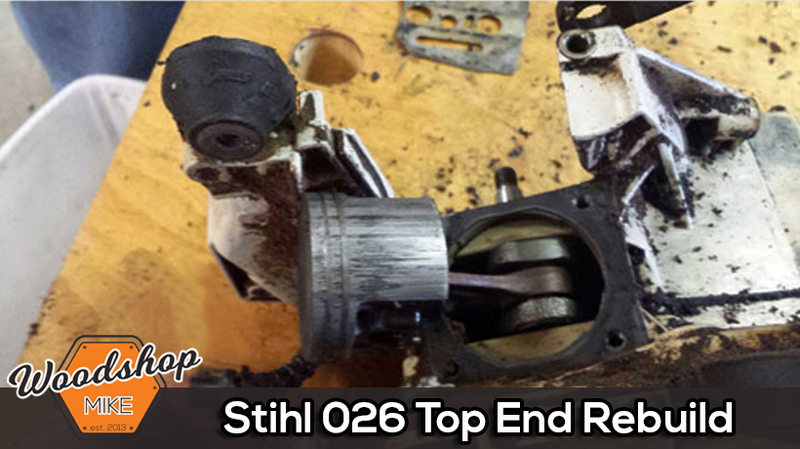 A Dying Chainsaw’s Last Words: Top End Rebuild. 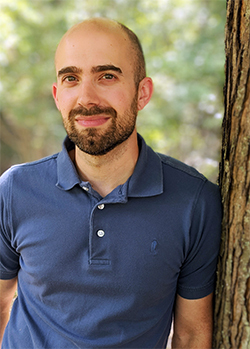 Thanks for reading, and feel free to leave any questions or comments. Thanks so much for this clear post. This is the way the internet was in the early days. Folks helping each other out without trying to sell them something. You rock sir! I’ve done this before but had some doubts as it was years ago. Your clear (and humerous) instructions really helped. As russell fischels experienced, the needle in my kit was wrong for my carb. (much larger than original). For reference it was a kit labeled ‘Forester’ #18157. My only suggestion would be to add an edit: remove and cleane the low and high speed adjustment screws as well as their ports. Thank you for the kind words Mark! I’m glad the article was helpful! Cheers!